Since the mid-1970s, Barbara Kasten has been making abstract pictures that reveal and exploit the medium’s underlying properties—in particular, photography’s dependence on light to record material phenomena and its tendency to flatten or otherwise distort the viewer’s perceptions of a given volume, spatial relationship, or object. 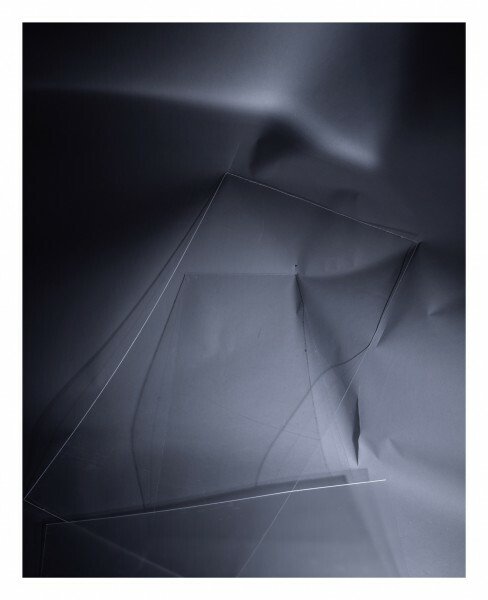 Kasten will typically build a still-life tableau in her studio, using pieces of glass or Plexiglas, mesh screens, mirrors, and other materials that can be transparent, reflective, or both. The resulting compositions slide between the hard-edge dynamism of Constructivist painting and the dematerialized object of Light and Space art. Titled “Ineluctable,” Kasten’s current solo exhibition situates a few of her key cyanotype and Polaroid works from the 1970s and ’80s in dialogue with a larger selection of recent photographs. A shimmering piece of mesh at the center of Screen Cyanotype, 1974, finds its counterpart in the undulating, wavelike patterns created by light hitting layers of moiré and mesh in Kasten’s Studio Construct #127, 2011. Similarly, the Plexiglas edges that appear as multicolored rays in Studio Construct #118, 2011, echo the projecting lines of yellow, red, and black crayon that Kasten drew around the edges of a rectangular shaft of light in Untitled 4, 1979, as if she were diagramming or reinscribing the shaft’s volumetric form. In these and other works, the viewer’s perception of material reality abuts photographic illusion. And yet, the backdrop of Studio Construct #125, 2011, shows several creases, a small hole, and a larger gash, results of a piece of Plexiglas pressing into the paper. À la Roland Barthes’s punctum, Kasten’s “puncture wounds” literally point to the composition’s grounding in the real, and to the inherent fragility of her tableaux. With this simple gesture, Kasten also refers us back to photography’s fast-fading origins as an indexical register, a medium where form is derived from the immaterial—yet utterly ineluctable—impression of light on paper.